The Triptych is a cosmology. In spite of its name and the fact that it consists of three conjoined sections, each created by applying cut-outs and painted images onto both sides of 58 successive layers of thick glass pressed together, its basic structure is defined by its recto and verso, the latter of which depicts a sort of underworld, an unconscious, a dark limbo of inchoate forms and undefined potentials which percolate into existence above (that is, into the domain of the recto) through the constant agency of the life, or creative, force embodied in the figure of the snake, whose very skin is comprised of these multifarious possibilities, and which writhes through and lords over this nether realm, suggesting that the essential process it invokes is fundamental and endless—ourouboric—a cycle of ineluctable creation, destruction, and transformation. 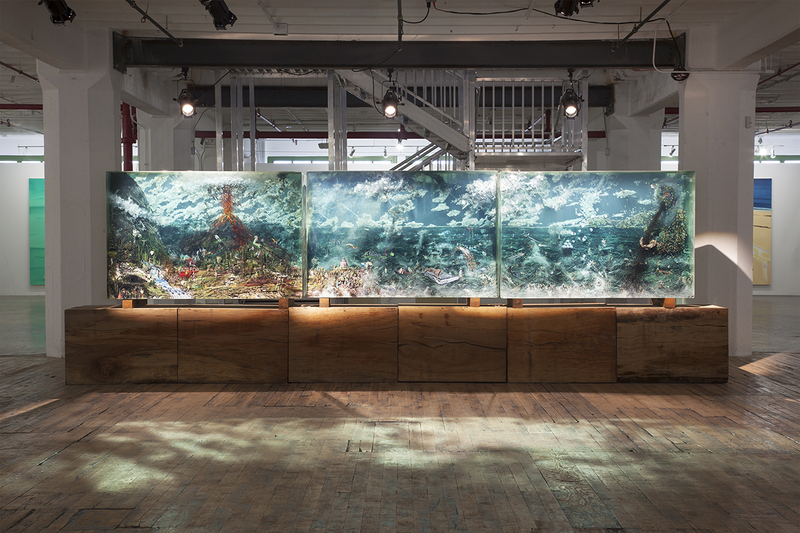 Dustin Yellin, “The Triptych,” 2013. Glass, acrylic, collage, 49 x 216 x 27″, 24,000 lbs. Courtesy of the artist. Photo by David Deng. The recto of The Triptych is dominated by the two large and inherently dual poles, of an erupting volcano/tree—as with all of the key imagery in The Triptych, it is both a vital and a destructive principle—and the voracious Mammon/Green Man that towers over the right-hand section regurgitating oil. Its outstretched arm reaches toward the pomoid spheres before it and, really, anything else in its ambit. The essential daemonism of Yellin’s vision—that the life force, whose only purpose is to express itself, is pure and partakes indifferently of good and evil—demands that energy expend itself, that it submit to a universal systole and diastole, something along the lines of an eternal recurrence. But unlike Nietzsche’s joyful understanding of that mythos, Yellin’s embodies the melancholy and hopelessness of the inevitable descent into self-destruction, and its Sisyphean repetition. The tiny vignettes and errant imagery that articulate the undergrowth of The Triptych’s recto are often themselves instantiations of the duality of all things. The conceptual structure of The Triptych is plotted against the quasi-Biblical triad of snake, tree (volcano), and man and their three corresponding energies: vital, telluric, and technological. Creation is itself portrayed as exploitation or consumption and calls forth destruction; man’s rapacity snowballs into technological systems that undermine (and define) his humanity; and the vast telluric—and cosmic—forces that are already themselves omnipresent threats and sources of power, are urged toward their tipping point by headlong human exploitation. 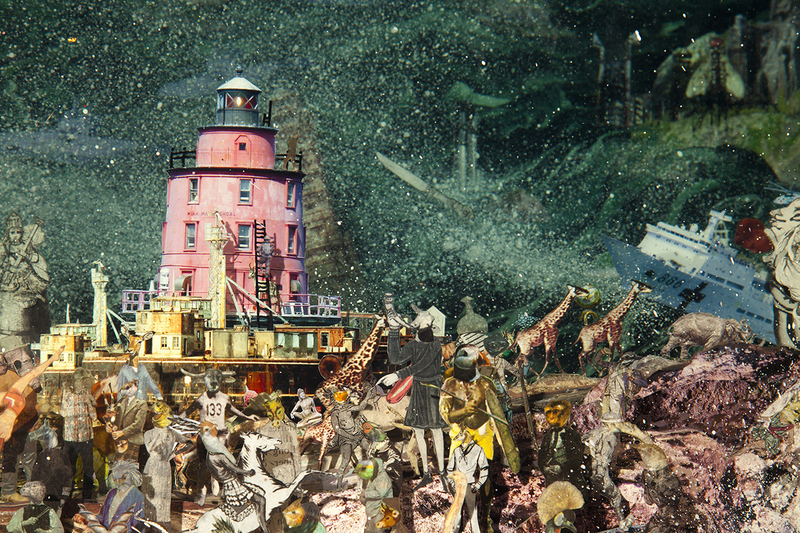 Dustin Yellin, “The Triptych (detail),” 2013. Glass, acrylic, collage, 49 x 216 x 27″. Courtesy of the artist. Photo by David Deng. As the Green Man turns its substance into oil, as man turns nature into oil, as nature turns death into oil, so does oil transform life into death, all metamorphoses of carbon—with a great deal of energy expended and accrued in between. The telluric melds into the human and the human into the technological, the technological back into the telluric as it inevitably eventuates in the destruction of life and the beginning again of the same immemorial process, all interconnected. Like the angel of history, pinioned and unable to avert its eyes from the accruing disaster, Yellin does not flinch, if perhaps he weeps.